Redux is like it never has been before. It’s walls are painted emerald green and are filled with white chalk drawings and organic bursts of bright red paint. There’s a mystical hum in the air as Artist in Residence, Yulia Pinkusevich transforms Redux’s gallery into a site-specific installation that examines the urban city as a relic. Imagine a world of densely layered urban dwellings. Skyscrapers and labyrinths of tunnels fill this vision. This world is disconnected from nature and unaware of its ambient environment. Humans are stacked in layers, living atop one another in soaring structures. The aggregate map of their psychology is manifested in the form of their city… and then imagine it destroyed. This is the vision Yulia is exploring as she prepares for her latest exhibition, Reversion which opens this Friday, March 29, from 6-8pm. 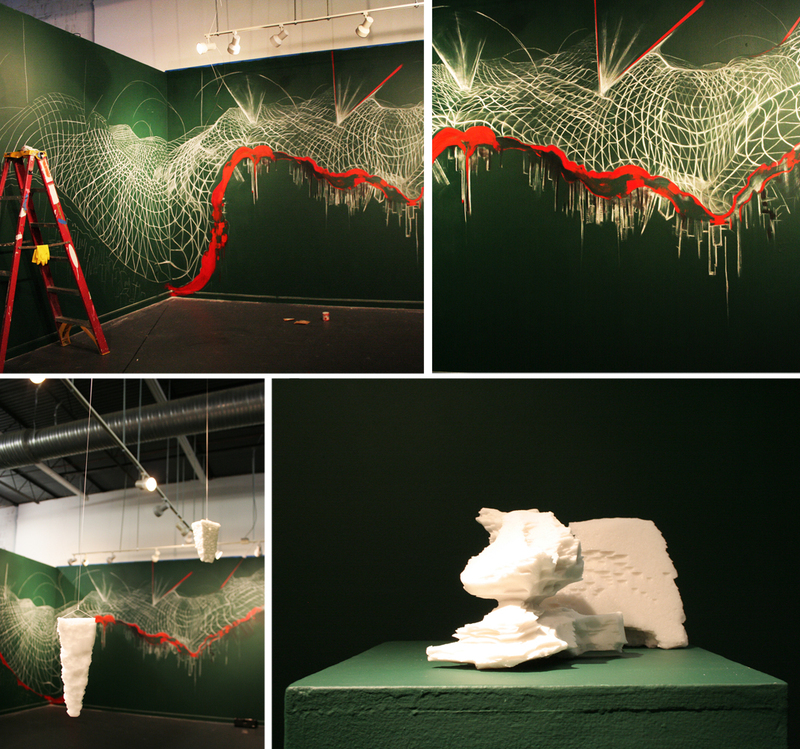 Redux Intern, Cameron Bolus, captured these images of her work in progress. Don’t miss your chance to meet this amazing artist and experience her compelling vision. This entry was posted in Artists, Events, Exhibitions and tagged Reversion, Yulia Pinkusevich. Bookmark the permalink.